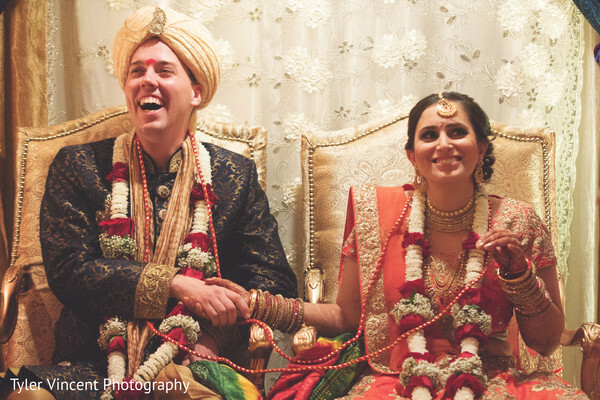 Mital & Rex’s big day was the quintessential package: long-standing Indian traditions were their something old, outfit ideas were Rex’s something borrowed, the reception was something blue, and something new came about with the unison of their families! 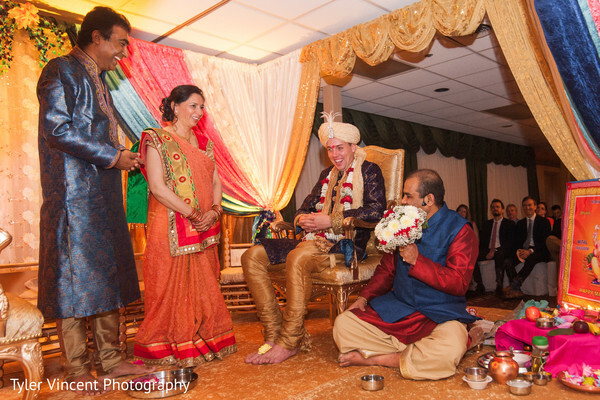 Planet DJ Productions orchestrated the Baraat, which would have surely been a fun something new for Rex and his wedding party! 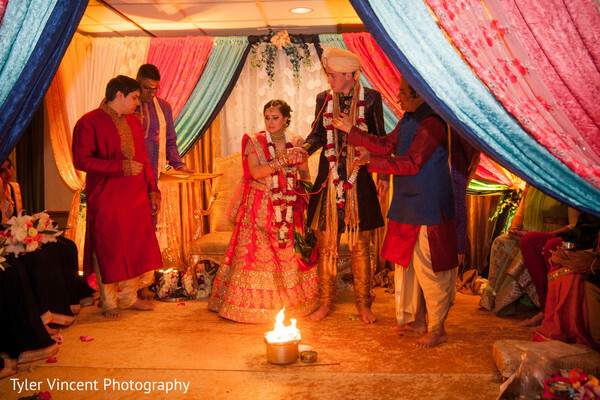 The cozy Gujarati ceremony hosted at the Lakeview Golf Resort and Spa was an interplay of offbeat colors ranging from pastels to bright hues and pops of red. Zaccagnini’s Morgan Town Florist decked up the centre of the mandap in navy blue, sky blue, and coral pink Chantilly lace drapes, and created an ombre effect using ivory and beige drapes toward the corners. A navy blue baroque sherwani with a cream Sehra flattered Rex, while Mital opted for a traditional ornate red bridal lehenga from Wedding Showroom. 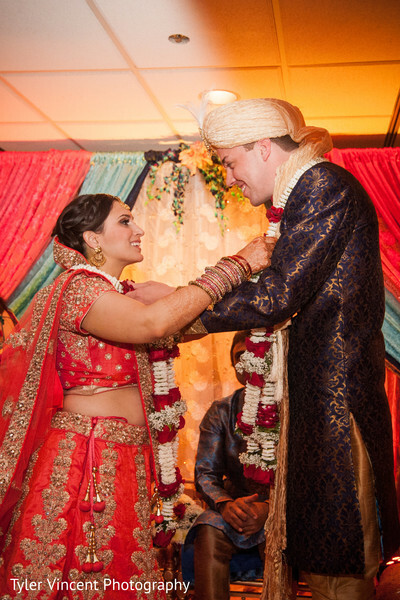 Hayley Carlin from Toni Exquisite Hair styled Mital’s hair in a low braided bun which held up her tulle red dupatta-veil. 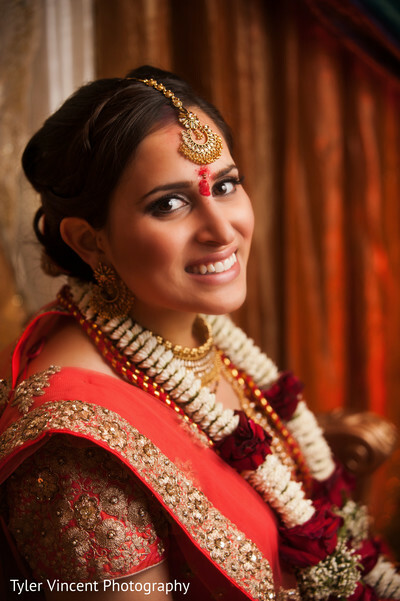 Our blushing bride had a flushed, pink glow thanks to Beauty by Joy Lager! Her bridesmaids were dressed in lovely navy blue chiffon saris paired with pearl-embellished ivory blouses, and Rex’s groomsmen coordinated in dull gold kurtas and navy blue bottoms. Mango Grill, headed by the award-winning global chef, Raj Agarwal, catered versatile and succulent Indian and Thai cuisine. Tyler Vincent Photography brilliantly captured this multicultural galore, which you can explore in detail by heading to the gallery! We’ll bring you all the specifics of Mital and Rex’s fusion reception in the next post, and until then, let you do some guesswork on how the reception was styled!